Sometimes when you step into a previously unvisited church, you instantly know that it is in safe hands. There's something about the sense of welcome, the little details that show some thought has gone into the Christian duty of hospitality. The first time I ever came here, it was immediately after trying to visit St Botolph at Burgh, a field or so away. 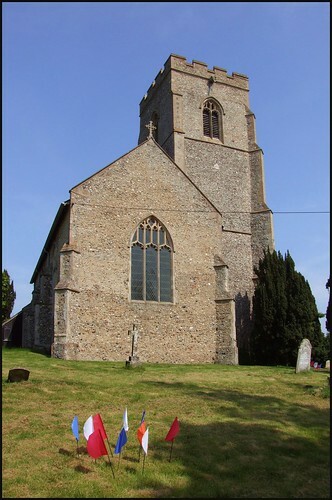 In those days, Burgh church was kept locked, but here at Clopton I found a welcoming, loved church; not one of Suffolk's most significant or beautiful, but with a sense of continuity, and of being the heart of a faith community. And guess what? Today, Burgh church is just as open and welcoming as Clopton, which is wonderful news. This is a big church, high above the road, although this is mainly because the roadway has cut down over the centuries. The 14th century tower is one of Suffolk's south ones, and forms the entrance porch beneath. There is a small stone with a consecration cross in it set to the right above the outer arch, but I think that it is not in its original place. It is probably part of the medieval altar mensa, broken up at the Reformation. It was probably used for some building repair at the time, and then rescued in the 19th century by a more sacramentally-minded generation, and set here. I'd really been looking forward to coming back to Clopton church, but my heart sank as I cycled up the hill from Burgh. Along the verge were signs informing me that this was the weekend of the Clopton flower festival. Flower festivals are not so much a tradition as an English passion, a madness of a kind, popularised in the second half of the Twentieth Century as a kind of spring counterbalance to the Harvest festivals of autumn. Churches are taken over and filled with flower-related displays by enthusiastic locals. Many people like them, but I always find them difficult, not least because they make photography very awkward. I considered cycling past and coming back another day, but it seemed to me that this was a church with very few significant architectural or historical details to be covered up by flowers. What I had loved it for was its overall feeling, and its sense of welcome. And so I hauled my bike up to the south door, and stepped inside. Well, it was brilliant. The parish had taken as its theme the 1950s, with one display from each year. As well as the flowers, there were old photographs and newspapers, there were books and records, there were clothes, ornaments, ration books and other artifacts which the people of Clopton had taken down from their attics, given a dusting and restored to the light of day. I loved it. Even better, there was a second hand bookstall, and I ended up buying far more than I could comfortably carry back to Ipswich. The parish had done itself proud. I was able to see, and photograph, everything I remembered, pretty much. Only the pretty late medieval font was put out of bounds by a draped christening gown, and this in itself was interesting, of course. Clopton is a church which attracts a fair number of visitors from across the Atlantic. Between this churchyard and that of the redundant church of All Saints at Debach two miles away once stretched one of the largest World War II USAAF bases in East Anglia, and at the west end of St Mary hangs the flag that flew over the base during those dark days. The memorial board lists a vast number of names, a quantity shocking in this intensely rural and sparsely populated parish. Most of the internal fixtures and fittings of St Mary are fairly basic 19th century work. The restoration of the 1860s was carried out under the energetic direction of the Rector, Richard Palmer. This was not unusual, and 19th Century East Anglia had hundreds of Rectors like him. But he is one I remember more than most. Clopton church, like neighbouring Burgh, has a graveyard worth exploring. One particularly moving set of three stones can be found east of the chancel. The first is Sacred to the memory of Agatha, daughter of Reverend Richard Frederick and Julia Jane Palmer, 14th February 1873, aged nine weeks. Suffer the little children to come unto me. t is easy to console ourselves that one in every two children born alive in the late nineteenth century failed to reach adulthood, but this is no consolation at all. The death of a child hurt as much a century ago as it does now. This little girl must have been born at Christmas, to die on St Valentine's day. Her father, the young Rector, must have gone about his liturgical duties with his little daughter's life hanging in the balance. We can imagine the awful winter funeral, the Rector burying his own baby. How do we know that he was young at the time? Because the middle stone records his death, six years later. It reads Sacred to the memory of Richard Frederick Palmer, eleven years Rector of this parish. Died 8th May 1879 aged 38 years. One wonders what carried him off in the spring, to die so young. And so to the third gravestone, which, as you have probably already guessed, reads Sacred to the memory of Julia Jane, the beloved wife of Richard Frederick Palmer, who died 4th September 1884, aged 45 years. A quiet tragedy, then, in a forgotten corner of Suffolk.